Viable intelligence requires surveillance of the highest caliber. To attain such, altitude is one of the mandatory tools required for mission success. AGS was formed on November 9, 2001 as an independent corporation, and a wholly owned subsidiary of SES AMERICOM. The Company offers satellite bandwidth and custom satcom network solutions to U.S. government agencies, including Defense, Civilian, State, Department of Homeland Security and Intelligence, as well as to commercial contractors who support government contracts. GMV is a privately owned technological business group with an international presence. Founded in 1984, GMV offers a variety of solutions, services, and products in very diverse sectors, including Space, Defense, Telecommunications, and Information Technology for Public Administration and large corporations, among others. As the Commander, Space and Missile Systems Center, Air Force Space Command, Los Angeles Air Force Base, California, Lt. Gen. John T. Tom Sheridan is responsible for managing the research, design, development, acquisition, and sustainment of space and missile systems, launch, command and control, and operational satellite systems. With more than 6,500 employees nationwide, General Sheridan is also responsible for an annual total budget ithat exceeds US$12 billion. Ric VanderMeulen is the Vice President of Government Satcom at ViaSat Inc. and he leads the Companys efforts to transition commercial broadband network-centric satcom architectures and products to the government market. The group is developing the nexgen Government standard Satcom Modem and is integrating systems for DoD deployments in multiple theaters worldwide. The military deputy for the Sensor Assimilation Division in the Acquisition Directorate at the National Geospatial Intelligence Agency Headquarters (NGA) in Reston, Virginia, is Commander Joseph Smith. The NGA is a Department of Defense combat support agency and a member of the national Intelligence Community (IC). NGA develops imagery and map-based intelligence solutions for U.S. national defense, homeland security and safety of navigation and provides timely, relevant and accurate geospatial intelligence in support of national security objectives. Paul Scardino is Vice President, Sales & Marketing for Globecomm Systems, and oversees sales and communications across all of the companys lines of business. We spoke to him last December about how the well-known systems integrator is changing to match a changing world. Dan Losada is the Senior Director of the Defense and Intelligence Systems division at Hughes where he manages the Companys Department of Defense (DoD) and intelligence-related programs. Dan is heavily involved in supporting C4ISR (Command, Control, Communications, Computers, and Intelligence, Surveillance and Reconnaissance) programs. Terry Benson serves as the business area manager for communications systems at Overwatch Tactical Operations. In that role, Terry is responsible for program management, business planning, and new business development. He joined the company in 2005 to lead the SATCOM business area, and hes overseen program execution, business development, and strategic plan development. Terry has more than 24 years of industry experience, working in the military and commercial markets. In this presentation, we will look at military early warning satellites, electronic intelligence gathering satellites, and ocean surveillance satellites launched by the United States military forces. Information about these satellites is invariably secret and the satellites are not given a name at the time of launch, or, in recent years, are grouped in a series of diverse military satellites simply identified as USA, without any further indication as to the objective. The tragic terrorist attacks in Mumbai on the 27th of November killed nearly 200 people including a large number of Indians, as well as nationals from the U.S., Germany, Canada, Israel, Britain, Italy, Japan, China, Thailand, Australia and Singapore. This horrific incident has been suggested as a tactical shift in terms how terrorism will be carried out in future attacks. COMM OPS: Trends in Communication Systems For ISR UAVs, by Steve Gardner, GM, Enerdyne Technologies, Inc.
by Steve Gardner, GM, Enerdyne Technologies, Inc.
During the past six years of combat in Afghanistan and Iraq, all doubts about the utility of Unmanned Aerial Vehicles (UAVs) in providing mission critical ISR (Intelligence, Surveillance, Reconnaissance) for war fighters have been erased. In 2002, UAV systems (a ground station supporting a number of aircraft) deployed totaled 16. In 2008 the number of systems in theatre exceeded 1,000, with nearly 6,000 aircraft fielded. Wherever emergencies happen, on a battlefield, across a disputed border, or as the result of hurricanes, floods, or fires, on-site communication managers face an immediate set of unnerving trade-offs. SatNews Publishers is the official Media Sponsor for the FIRST NAB Military + Government Summit at the NAB 2009 Exhibition and Conference. 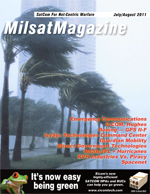 Should you wish to consider editorial content for either the March issue of MilsatMagazine and/or SatMagazine, which will be printed and distributed at this premiere event, please contact Hartley ASAP and let's chat!